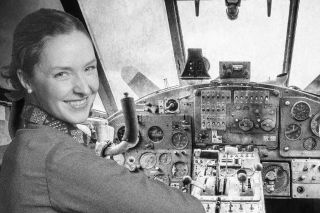 Amanda Quaid portrays Geraldyn (Jerrie) Cobb, the "almost-first" woman to fly in space, in the play "They Promised Her the Moon," coming to New York City in May. Decades before Sally Ride became the first American woman in space, pilot Jerrie Cobb was part of a private initiative to select and train female space fliers. A new play, coming to New York City's Theatre at St. Clements in May, documents Cobb's early life, testing to be an astronaut and the ultimate dissolution of the program, just before Russian cosmonaut Valentina Tereshkova became the first woman in space when she launched on the Soviet Vostok 6 mission in 1963. "They Promised Her the Moon," produced by the Miranda Theatre Company, will run Off-Broadway from May 15 to May 27, with preview performances starting May 12. You can get tickets online here. Three performances will also feature talk-back panels after the show about images of women in the media (May 17 after the 7 p.m. performance); the future of women in science, technology, engineering and math (May 21 after the 3 p.m. performance); and the challenges of portraying famous women, featuring actors from the show (May 22 after the 7 p.m. performance). Cobb was one of more than a dozen women who underwent privately-run astronaut testing in the early 1960s — a group later known as the Mercury 13. These potential female astronauts were tested by Randy Lovelace, the NASA contractor who performed the official physical tests to select the first seven (male) NASA astronauts for the Mercury program (that group was called the Mercury 7). Through rigorous — and sometimes very strange — space-readiness testing, Lovelace tried to prove that women could qualify for the demanding training process and spaceflight experience. Cobb was the first woman to pass all three phases of the Mercury astronaut program testing, but Lovelace's program lost funding, and none of the 13 female finalists went on to fly in space. (Astronaut John Glenn testified against the possibility of woman astronauts shortly after, in a 1962 congressional hearing about the prospect of female crewmembers.) The first official female astronauts in NASA, including Ride, were not selected until 1978. In "They Promised Her the Moon," playwright Laurel Ollstein, director/producer Valentina Fratti (who is named after Tereshkova) and six actors, each playing a variety of roles, portray a time in history where women strove to fly — and how the "almost-first" woman in space was denied the chance to make history.